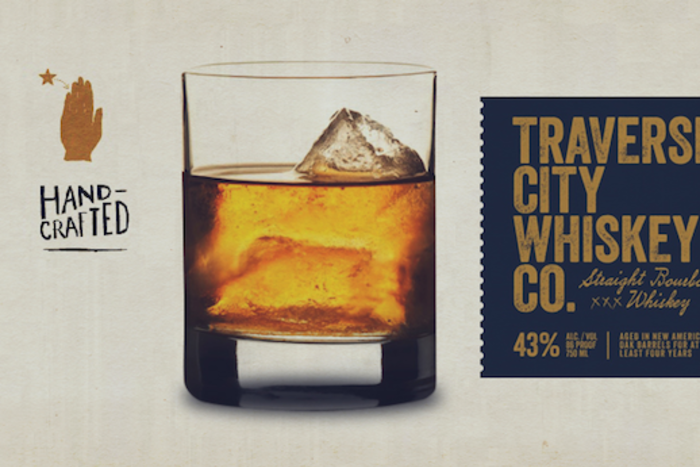 Traverse City Whiskey: Now Made in Traverse City! There are some aromas I simply cannot resist. The smell of bourbon is one of them. It’s a rich, complex, organic scent that arises from the long interaction of grain, yeast, sugar and charred oak barrels. And the new tasting room of the Traverse City Whiskey Co., is permeated with it, thanks to the rows of full whiskey barrels stacked in the distillery room out back. It’s an odd place for a tasting room, too – this small brick building at the corner of Fourteenth and Cass. Built in 1929 as a substation for the Traverse City Light & Power Co., the 2,200 square foot structure was later home to a screen printing company. 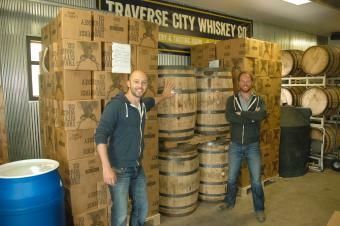 But on May 23, it’s going to officially open as the home of Traverse City Whiskey, the area’s latest microdistillery. Which isn’t to say that you can’t wander in and taste a little before then. (As I discovered, they’re already open from 3 to 8:30 pm on weekdays and from 1 to 10:30 on Friday and Saturday.) But the three owners of TCW – Chris Fredrickson, Jared Rapp and Moti Goldring -- want to make sure all their t’s are crossed and all their i’s are dotted before they make any announcements. You can hardly blame them. They sold their first bottle of Traverse City Whiskey three years ago, but it’s taken them until now to actually get things up and running – until this week their bourbon (in spite of its name) was being made at distilleries in Chelsea and Indiana. Chris is a Traverse City native. His love affair with whiskey began five years ago when he and his dad came across a set of distilling patents that his great-grandfather had been granted back in the 1920s. He took them to Jared and Moti (two bourbon-loving friends from MSU) and the three of them began thinking about starting a small distillery. “We wanted to call it Traverse City Whiskey because this is where I was born and raised, and the Traverse City name said all the things to us that we loved – the outdoors, the active life, the quality of something good and made by hand,” he says. But it wasn’t easy, and it took a lot longer than they expected. 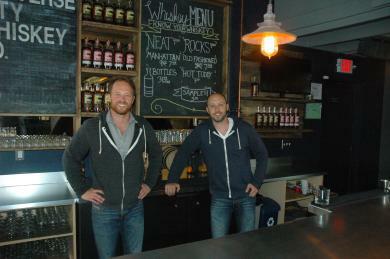 They made their first sale in 2012 – to the Dockside Party Store on West Bay – but didn’t have enough money scraped together to have an actual location of their own. Over the years (thanks to that magical Traverse City name) they gradually increased sales throughout Michigan and parts of several neighboring states until they were able to buy their current building. Buying a building isn’t the same thing as being ready to open, though – and getting approved as a tasting room isn’t the same thing as getting approval for a full-scale distillery. Now, four years after they started the company, they’ll finally be able to put it their whole operation under one roof, producing an estimated 300 bottles of whiskey a day with their brand-new German still apparatus and putting it into new American oak barrels. In the meantime, of course, they’ve got plenty of inventory for sale – both their original four-year-old straight bourbon and a cherry-infused “American Cherry” version. (There’s also a plan to begin making a rye whiskey in the near future.) And their new tasting room – decorated in that industrial-chic style so popular with nearby breweries – is available for tastings, cocktails and sales of bottled spirits and various kinds of Traverse City Whiskey swag. It’s small, with seating for maybe 30 to 35 people, but they’re planning to put in a small outdoor patio this summer.